August is upon us. And while the new term starts in just over a month, there are a handful of events taking place at the University of Toronto that are worth a brief return to campus before you hit the books – including a massive beer fest and a track and field competition. Or join U of T community members for events taking place across the GTA, from a storytelling walk on the Danforth to a basketball game between U of T and U.S. powerhouse Duke. After the shooting on the Danforth that killed two people and injured 13 others, Torontonians grappled with how to make this city’s streets safer. A group of city builders are gathering on the Danforth to talk about how to improve public safety by lending their experience and expertise to the conversation for the Safe + Connected Streets story-based public walk. The event is sponsored by U of T’s Centre for Community Partnerships. 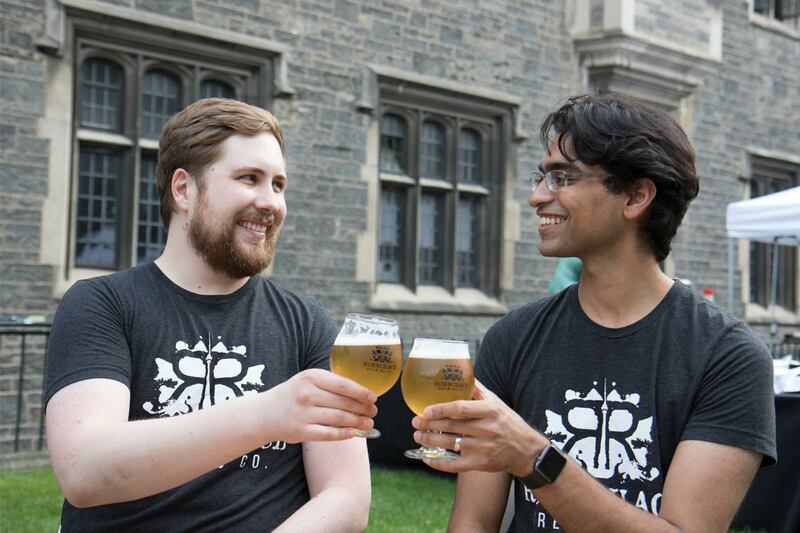 Grab your tickets for Hart House’s annual Craft Beer Festival and BBQ soon because there are only a limited number of tickets still available. Your ticket includes eight beer samples, a reusable take-home sampling glass and an unlimited barbecue feast. Catch the Island[s] exhibition at U of T’s Art Museum until Aug. 18. Artists interpret the concept of “islands” – as physical spaces, but also their history, memories and stories – through a variety of media including poetry, drawing and video. Coming to U of T in the fall? Participate in Student Life’s Facebook Live Q&A session on how to excel academically at U of T. You’ll hear from Jonathan Vandor, a learning strategist with the Academic Success office, who will be answering questions about the tools you’ll need to navigate your first year of classes. Grad students: Tighten your laces and head to the Athletic Centre for a game of dodgeball as part of the Grad Escape activity series. No experience required but pro dodgers are welcome. Cheer on Team Canada as they compete at the North American, Central American and Caribbean Championships event Track and Field in the 6ix, taking place at Varsity Stadium. Thirty-one countries are competing – plus you’ll have the chance to meet some of Canada’s Olympic medal-winning stars, including sprinter Andre De Grasse. U of T’s Varsity Blues basketball team will be facing off against Duke University’s Blue Devils during the U.S. team’s first trip to Canada. Duke has captured headlines this summer for having three of college basketball's most anticipated freshmen players, including Canadian R.J. Barrett. Catch the game at Mississauga’s Hershey Centre or on TSN. Want to chat about the cosmos over a craft beer? U of T’s Dunlap Institute for Astronomy & Astrophysics is hosting its regular Astronomy on Tap T.O. event at the Great Hall on Queen Street West. There will be space talks from U of T astronomers, games and prizes galore. While researching a book in Ukraine, Anna Shternshis, associate professor of Yiddish studies and the director of the Anne Tanenbaum Centre for Jewish Studies in the Faculty of Arts & Science, discovered a trove of Yiddish songs written by Soviet Jews during the Second World War. Yiddish Glory brings together world-renowned artists who will be performing those songs, which were thought to have been lost during the Holocaust, at Koerner Hall.